with ideality factor of unity. 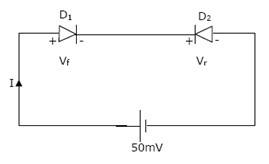 The thermal voltage VT = 25mV. compute the current I through the circuit. (b) Calculate VF and Vr.